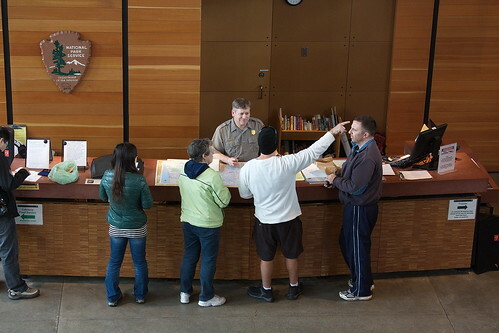 Ranger Curt in the Jackson Visitor Center, a photo by The Bacher Family on Flickr. 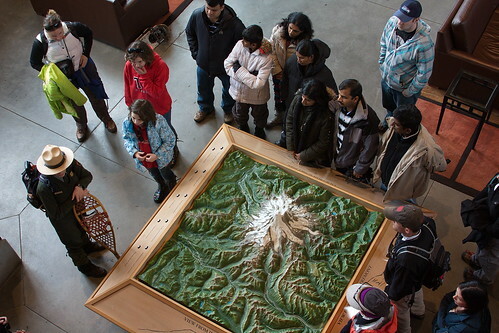 After snowshoeing with a good friend at Paradise in Mount Rainier National Park in mid May, we stopped in at the visitor center to warm up and check out the exhibits and gift shop. I shot this image from the balcony in front of the gift shop, looking down at ranger Curt Jacquot assisting visitors at the information desk. I'm pleased with how clear the picture came out, in spite of the dim light in the room. The patient smile on Curt's face also captures very well the attitude of great customer service that he provides. Here's another photo from the same spot, of ranger Judy Kennedy preparing for a snowshoe walk. It actually helps that it was a cloudy day--on a sunny day, the light and shadows in this part of the room can be so intense that half your image is either burnt out or plunged into darkness. Ranger Judy preparing for a snowshoe walk, a photo by The Bacher Family on Flickr. Photo of the Day: Seattle Pride 2011: Steph!